Nearly 34 million vehicles around the world have been recalled because of allegedly defective and dangerous airbags manufactured by the Japanese company Takata Corporation. Here in the United States, it's the largest recall in our nation's history. 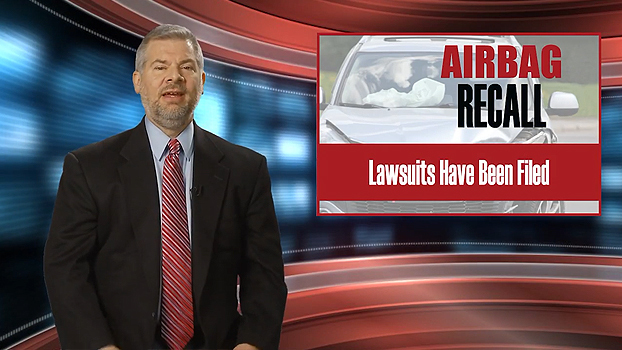 Many lawsuits have been filed in connection with these airbags. The suits claim that when there's a collision, the air bags can explode, spraying metal, shrapnel and glass inside the inside of the car. These incidents have been linked to injuries such as head trauma, paralysis, blindness and broken bones, as well as several deaths. Visit safercar.gov to learn if your vehicle is affected the Takata airbag recall. Simply enter your vehicle identification number (VIN). The VIN number can usually be found on a small metal plate on the driver's side dashboard, near the windshield. Airbags are supposed to protect people, not hurt them. When a company's negligence leads to innocent victims getting injured, our product liability attorneys work to hold them responsible. The defect in Takata airbags involves the use of ammonium nitrate, the chemical the company used to inflate the airbags. But when ammonium nitrate is exposed to moisture, the airbag can explode violently, causing the airbag to burst and sending shrapnel into the vehicle. Complaints have alleged that Takata knew about this defect for at least a decade. But instead of alerting federal regulators, Takata instructed engineers to destroy test data that showed the airbags were dangerous. These airbags have been linked to countless injuries and many deaths in the United States. Both individual and class action lawsuits have been filed against Takata. If you've been injured as a result of an exploding Takata airbag, call Gary Martin Hays & Associates to learn your legal options. We will aggressively protect your rights and fight to hold negligent parties responsible. You may be able to seek compensation for medical expenses, lost income, lost future earnings, pain and suffering and other damages. If a defective airbag caused your injury, the company will do everything it can to avoid taking responsibility and paying you what you deserve. Our lawyers have the experience and the resources to fight them for as long as it takes. We will conduct a thorough investigation of your accident and the airbags installed in your vehicle. When you've been injured, you need an aggressive and compassionate attorney on your side. Since 1993, our firm has built a reputation for getting results. Call Gary Martin Hays & Associates at 1-800-898-HAYS for a free consultation.